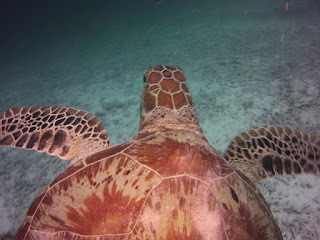 Yesterday we travelled to Mataking and dived on the far side of the islands, it was a turtle mecca there, we saw 6-7 before we even started the dive, however the number of fish was much lower than at Pom Pom and overall the dive was no less entertaining than most dive at Pom Pom. A few days ago in the afternoon we did a fish survey from the Pom Pom Northtip jetty where I saw my first Hawksbill of this trip, 4 Green Turtles and a meter long Bumphead parrot fish hiding under a large coral. The marine life is great and so many turtles.